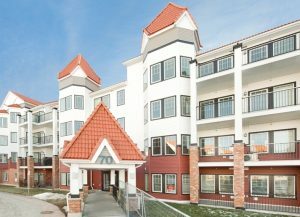 Thinking about buying a RedHaus condo in Calgary’s Royal Oak neighbourhood? You better hustle. As our headline suggests, the sales centre has been very busy this month while homes in RedHaus’ fourth and final building, the Vandenburg, have been selling fast. Why, you ask? Firstly, possessions start this summer, which means you have the perfect amount of time to prepare for your move into this sought-after condo community. Also, developer Streetside is currently offering buyers preferred mortgage rates and will cover legal fees and disbursement costs if you use their preferred lender and legal representatives. Another reason why RedHaus is red hot right now, is because Royal Oak is an established community, meaning shopping, grocery stores, restaurants, and many more neighbourhood amenities are just steps away the development. Then, of course, there is the range of floorplans to choose from, all of which include features like nine-foot ceilings and high-end appliances. Every home also includes its own heated underground parking stall. RedHaus’ sales centre is located at #126 – 30 Royal Oak Plaza NW in Calgary. It’s open 1pm to 7pm Monday through Thursday and 12pm to 5pm Friday through Sunday. For more info call 403 269 6024, email redhaus@streetsidehomes.com, or visit their website here.